I work at a company called Real Pie in Norwalk, working on social and web design for movies and video games. I also do freelance work where I mainly specialize in illustration and poster design, and the occasional album art project. Ever since the Ninja Turtles burst onto the scene in the 80s, I started drawing my favorite characters – obsessively. From there I moved on to drawing the Rocketeer, Star Wars characters — pretty much all the nerdy material I could find. However, by the time I reached high school, and entered the Studio Art program, I encountered a teacher who didn’t appreciate illustration, and more importantly, my personal style. I took it a little too personally, and felt maybe I wasn’t cut out for it. When I went to college, I was free of that negative judgmental atmosphere, and within only a few months, I knew I was going to be a designer. I had seen how some designers were able to incorporate illustration into their own work and I thought to myself, “this design thing could be my gateway drug into illustration,” and I could get paid along the way. After college, however, I became very interested in web design. 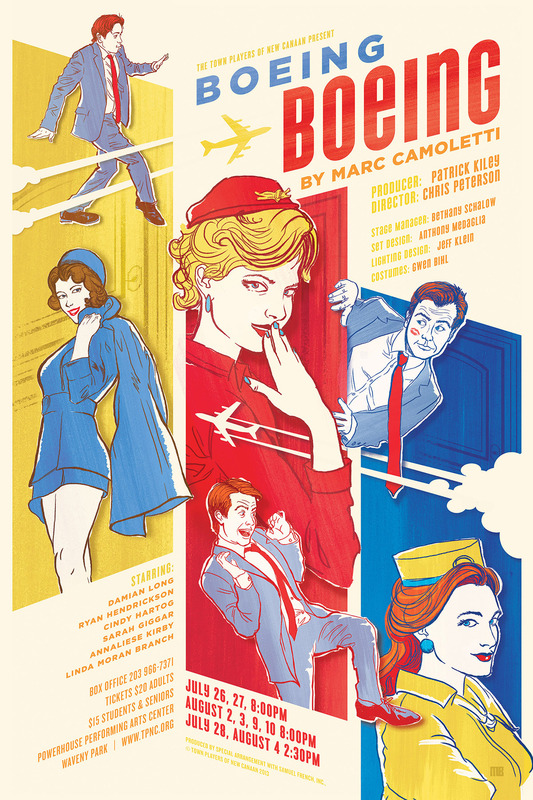 For a number of years I had nearly forgotten my love of illustration, until I started working on some pro-bono work for my home town’s local theater group: The Town Players of New Canaan. So nowadays, my work ranges from Websites, Brochures, Branding, Illustration, and some (light) motion graphics work. That variety means the job is always interesting, and thats why I’ll always be doing this! That’s a tough one, because ever since I was a kid (drawing cartoon characters) I would finish a piece, take a long look at it, feel some pride for a while, then inevitably feel bored and want to move on to the next challenge. Eventually, looking back at past projects, I tend to pick them apart and think about how I could improve. 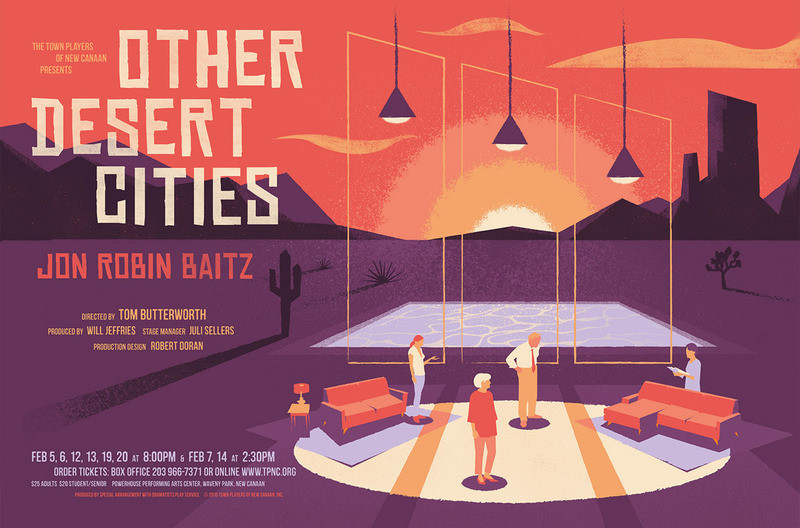 But if pressed, I would have to pick the horizontal poster I created for the play “Other Desert Cities” – I love mid century modern illustration, and I found it fun doing a landscape poster. I loved playing with the idea of depicting a family drama unfolding at home, but the walls are invisible, which I think creates a sense that their lives, and secrets are somehow exposed to the harsh environment… The invisible walls also evoke the feeling of Black Box Theater presentation… This could conceivably be a series for future Black Box Theater productions. I want to continue to love the work that I do, and have it reach a wider audience. Hearing that something I’ve created has inspired someone, or challenged them to think differently about a subject is very rewarding. I suppose a real challenge I’d like to rise to is to one day create a piece of entertainment or art, rather than just advertise someone else’s work. A graphic novel for instance. Someday! There are a range of styles of illustration and design that I love from different artists and sources. I am a massive fan of Malika Favre. Her work is absolutely beautiful. The minimalist style, the colors she employs, her use of negative space are just masterful. Her work is a big reason I tend to limit my color palettes. It is a fun challenge to overcome, but almost always results in a stronger, more cohesive design. Olly Moss is another inspiration. He is extremely clever, and while he is often copied (poorly) he is always evolving his style. I wish I could think like he could, each of his pieces is like a fun puzzle to solve. The work of Patrick Léger is amazing, his style works in modern applications, but evokes the 50s and 60s, and has such great texture and energy. His line work is perfect. The work of the late Darwin Cooke is also of great inspiration to me. The way he renders characters with light and shadow, rather than relying on outlines is fantastic. I’ve had the great opportunity to work with many talented designers and programmers over the years, but I’ve learned the most from Marcella Kovac from The Bananaland in Bridgeport, as well as Brian Grabell from Madison Mott (also Bridgeport). Marcella always finds a way to break out of the box and inject energy into everything she does, and Brian knows how to push something to it’s fullest potential, without betraying it’s original essence, the perfect Creative Director. I am most afraid for our planet, so any organization that seeks to educate people about the dangers of Climate change, or aims to reverse its causes is paramount to me. 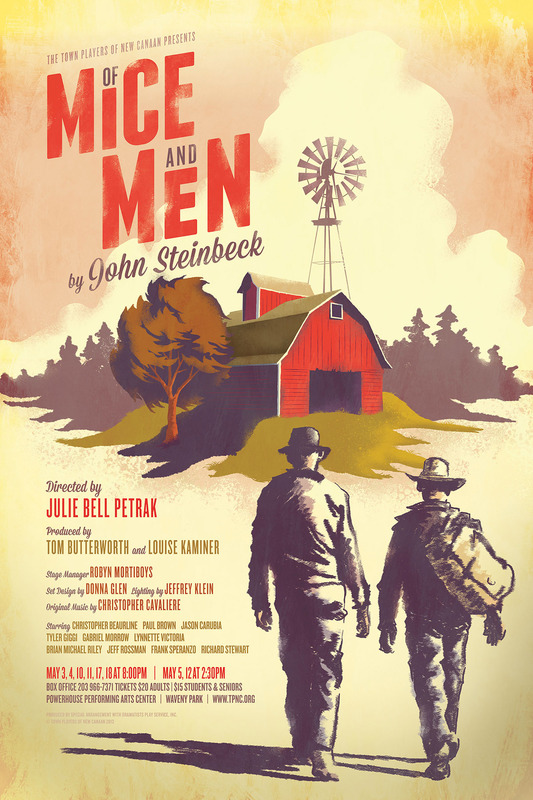 After college I became very interested in web design, and for a number of years I had nearly forgotten my love of illustration — until I started working on some pro bono work for my home town’s local theater group. I was born in California, but I’ve lived here since I was a few months old. 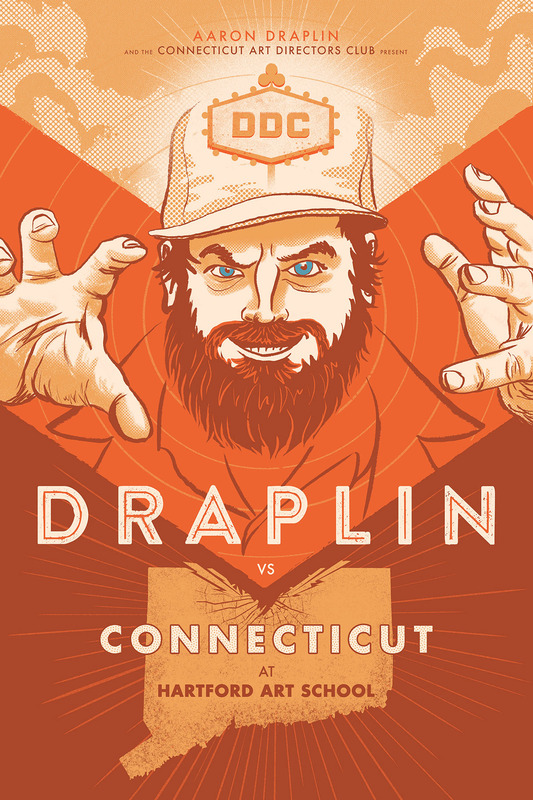 CT is home to me, and has never ceased to surprise and entertain me. It’s very close to the city, and yet is so tapped into New England. On any given weekend I could choose to hike beautiful trails or explore New York City; it’s really a great hub. The people of Bridgeport in particular have made me feel very welcome. It’s a very passionate and culturally rich city on the rise I think. I’m a self professed video game nerd. I play a lot of them and continually find inspiration, derive relaxation, and maybe some frustration from them… They’re never boring, and I find them to be the ultimate form of entertainment. They distill what I love about books, TV and Movies into an interactive medium, which really can’t be beat. Music and attending concerts is a big thing for me. My favorite musicians/bands are Queens of the Stone Age, Frank Ocean, Lucius, and Tool… I’ve got pretty eclectic tastes. I also love to hike, ski, and hang out with friends. When I first entered design school, up until the first few years of working in design, I didn’t realize how important typography was. It wasn’t emphasized enough in my college, and it took me a few years to catch up on that front. I wish I had brushed up on it earlier, maybe I could create my own font some day!